Tim Sawyer and Christy Collins Sawyer live and work together in a huge studio. 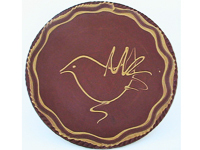 Their business, which they call Plank Road Pottery, sits on Main Street in Historic St. Charles, Missouri. Both Tim and Christy have long been involved in the arts. Tim was born in Denver, Colorado and raised all over the world, his dad having been in the Air Force. 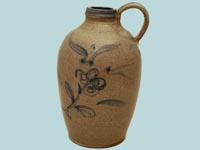 He began his pottery making at the University of Colorado and continued this interest at St. Cloud State University in St. Cloud, Minnesota. While there, he married Christy. Along with two of his favorite professors, Raleigh Kinney and Bill Ellingson, Tim created and participated in “The Studio,” a pottery co-op and working studio. Tim recreated The Studio in Woodland Park, Colorado, where he and Christy settled after graduation. The Studio was followed by twenty one years as an officer in the US Navy. Following this, Tim and Christy moved to St. Charles, Missouri so that Tim might attend Covenant Theological Seminary in St. Louis. He graduated with an MA in Theological Studies in 2000. Coming full circle, Tim returned to his first love when he enrolled at Lindenwood University in St. Charles to earn his MFA in ceramics. He graduated in May, 2004 and is now teaching classes at the Clay Co-op at the Foundry. Christy was born in Birmingham, Alabama and she, like Tim, was raised in a military family. Her dad being in the Navy, she was raised all over the United States. Christy attempted her first oil painting at the age of eight, for which she was offered $200. has always loved portrait and figurative painting but didn’t begin serious portraiture until after attending the National Portrait Seminar with John Howard Sanden. Since then Christy plunged headlong, in typical Christy-fashion, into the joys and sorrows of self-teaching. She learned the art of pottery-making at The Studio with Tim as instructor. Today she is busy at the new studio, teaching basic and intermediate wheel throwing as well as being a busy figure and portrait painter.